Last August, we reported on a Sherlockian themed challenge coin issued by the U.S. Army Criminal Investigation Laboratory. We now have a second challenge coin, with two major differences from our first reported challenge coin. 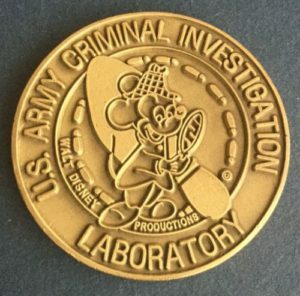 This second example features the badge of a Lab Examiner within the the U.S. Army Criminal Investigation Command, rather than the seal of the U.S. Army Criminal Investigation Command. Secondly, unlike most challenge coins, this new example has absolutely no color at all and appears to be in the base metal. 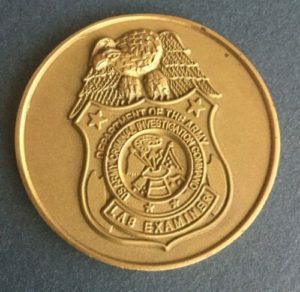 The appearance of a badge on the reverse of this challenge coin fuels the thought that there could be additional varieties of this challenge coin, with different badges for the various positions within the department. Happy hunting!